I’ve often heard the phrase that something is “as American as apple pie”. But what I didn’t realize growing up is that the UK does apple pie as well. 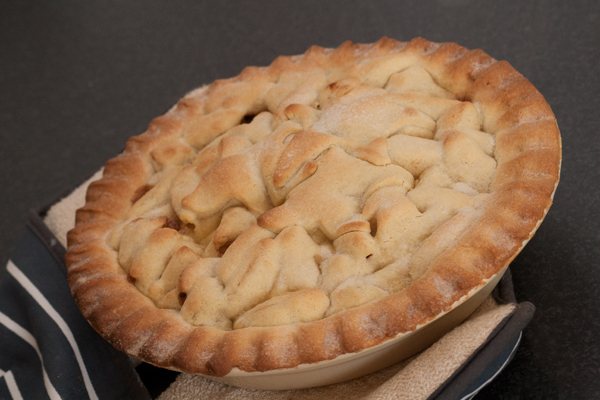 In fact, Britons make apple pie quite well. After watching an episode of The Fabulous Baker Brothers the other day, I decided to try my hand at pie. A trip to TKMaxx later, I was the proud new owner of a Le Creuset pie dish which meant that there was seriously no backing out of this recipe! It took quite a bit of time to prep all the apples, and the recipe that the Baker Brothers provided me with for the pastry didn’t make nearly enough – but I think the results were worth it. I’ll just need to make a few tweaks to the recipe so that the bottom pie shell doesn’t get soggy. Because nobody likes a soggy bottom. The recipe here has been my adaptation of the Baker Brothers. 1. First, make your pastry. Rub (yes, with your hands!) together the flour, icing sugar, and cold butter until they just start to come together. Then add in the egg yolks, salt, milk, and vanilla. Continue to mix until the dough comes together. You may want to put some flour on your hands before you add the liquidy stuff, otherwise you’ll end up in a bit of a sticky situation. Once you’re finished, place the dough in the fridge for at least 30 minutes. 2. Next, make the pie filling. Place your butter into a large pan and let it melt completely until it starts to foam a bit, then add in all of your apples. Let them cook until the outsides just start to go soft. You want them to retain a bit of their crunch to keep them from going completely mushy when baking. 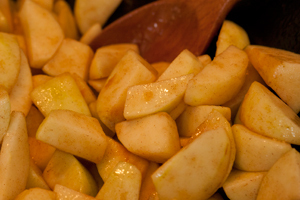 Add in your cinnamon, brown sugar, and lemon juice and keep turning the apples until they’re all nicely coated. Set them aside to cool. 3. Remove your pastry dough from the fridge and divide it in half. Dust your work surface with flour and roll out the dough until it is about 1/4-inch thick and large enough to cover your pie dish. Gently wrap the pastry over your rolling pin with the sheet and carefully place it into the dish, making sure it overlaps the edges. 4. Preheat your oven to 375°F (190°C). Then place your prepared pie dish into the oven for around 10 minutes, weighing it down with some baking beads or dried beans. This is called blind baking and will help prevent a soggy bottom crust. 5. 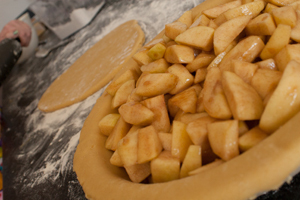 Remove your pie crust from the oven and pour in the prepared apple filling. Try not to get a lot of the melted butter/juices into the pie, as it will create too much liquid inside. Don’t worry – the apples will still cook down a bit and create a nice juicy pie. 6. 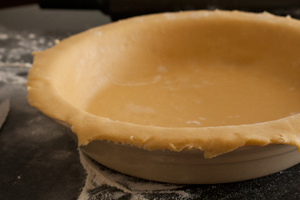 Roll out the second half of your pastry and repeat the transfer process to lay it over the top of your pie. Gently crimp the edges together using a fork or your fingers. If you have any extra pastry left over, cut out some cute shapes to cover the top if you’d like. 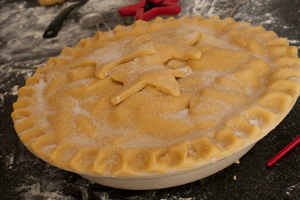 Then give the top crust a generous coating of granulated sugar. 7. Bake the pie for 30 minutes until the top is golden brown. If you start to see the edges getting too dark, remove the pie from the oven and cover the edges with some aluminum foil then return it to the oven to finish baking. Let the pie stand for at least 10 minutes before serving – but it is best served warm with some vanilla ice cream or some custard. Not only does it look good, but this particular creation tasted amazing! Cox and Bramley apples??? This is definitely not an American Pie. It sure looks pretty though.